Are you a gym rat? In the No Kids family that title goes to Amanda. She is at the gym for at least an hour (sometimes more) five days a week. Amanda is one of those people who just don’t feel right if they don’t get a workout in. I find this admirable. She has also found herself traveling more for work and that has been getting in the way of her routine. I found out the other day by watching my all-knowing Twitter feed that a gym opened inside BWI (Baltimore Washington International Airport). A gym at an airport just isn’t something that’s ever been on my radar as a slacker. I immediately realized the world of options that an airport-based gym would lead to. You have a long layover, go for a run, lift some weights, work of some of that stress. For people like me whose legs cramp after flying long distances, seize the opportunity to stretch those muscles before continuing on your next leg. You’ve always had a lot of workout options while traveling, but you may not have realized it. 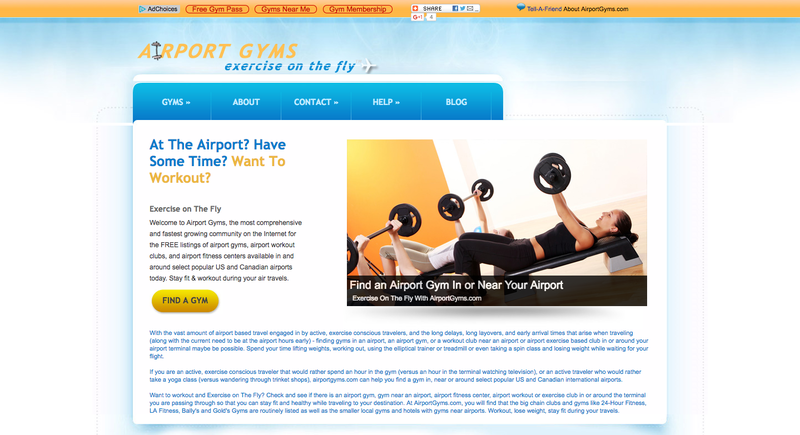 The website Airport Gyms gives you names of hundreds of gyms located near and sometimes in airports across the US and Canada. The biggest downside of a gym located even 10 minutes away is that you have to leave the airport. Depending on traffic, that could lead to a lot of stress about getting back to the gate for your flight. The cost of a taxi and what to do with your carry-on are other issues. But Airport Gyms has an easy-to-use interface and provides information on hours, location, what they offer, and the cost of a one-day pass. The latest club to enter into the market is ROAM, which opened its first health club in the aforementioned BWI. ROAM is focused on being your one-stop shop and catering to the needs of travelers. The new fitness company has put their gym behind the security gate so you no longer have to worry about getting back through the line after an attempt at an off-campus workout. ROAM also has included showers, and for me that alone would be worth the cost of a pass: $25 a day, $150 a month, or $500 a year. I mean there’s nothing like the guilt of being the guy on the plane who’s starting to turn ripe after 20+ hours of traveling. The gym is all-inclusive, too. You have access to private showers and receive complementary clothing and shoe rentals for your visit and they even provide the towels. If you want to wear your own workout clothes but don’t want them stinking up your suitcase, they’ll vacuum pack your sweaty clothes. You also have a concierge who will keep track of your flight and make sure you don’t lose track of time or tell you when your flight is delayed, leaving you have more time to work out. ROAM may only be at BWI for now, but they make no secret about their plans for expansion. I don’t love working out. I just don’t. I don’t seem to get the mental benefits that Amanda gets from doing it. But the idea of access to a gym — and especially a shower — during a long flight delay seems to be worth the price of admission.